All over the world, people are queueing up hours or days early to get their hands on the new iPhone X. In London, the first man in the queue has been there since Tuesday. There are similar queues everywhere from San Francisco to Singapore. The iPhone X finally goes on sale on Friday morning -- but people have already been queuing up outside Apple Stores for days to be the very first to get their hands on it. In London and elsewhere in the world, queues of die-hard Apple fans are forming, prepared to camp out for a night or more to buy the eagerly anticipated tenth anniversary Apple smartphone. Announced in September, the iPhone X is the first major redesign of the iPhone in years -- introducing an almost edge-to-edge screen, facial recognition technology, and an increased emphasis on augmented reality. It became available to pre-order on October 27, but sold out within minutes. There's currently an estimated delivery wait of four-to-five weeks -- leaving people determined to get one on day one with little choice but to wait in line for a day or more to get one of the scarce handsets. 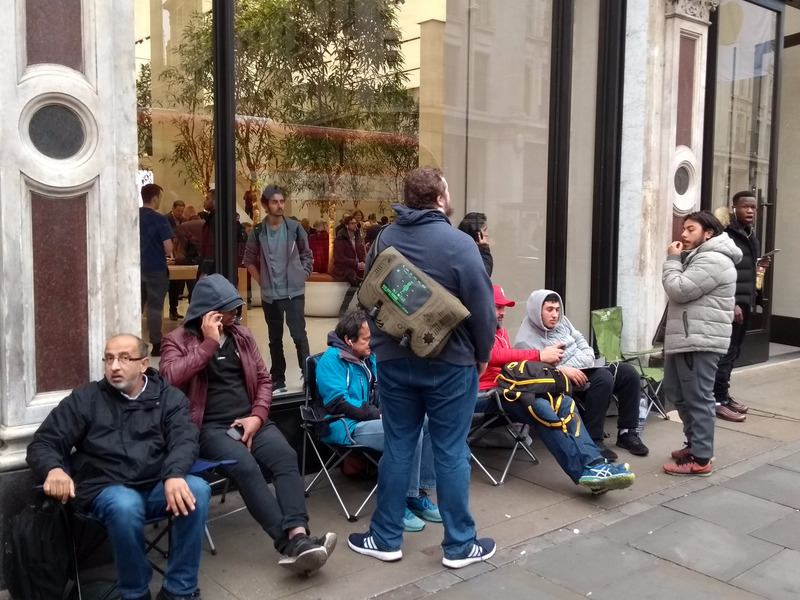 As of early Thursday afternoon at the flagship Apple Store in London on Regent's Street there were a little over a half a dozen men in the queue. The first person in line had been there since Tuesday. He told Business Insider he had originally turned up on Sunday night, but saw there was no queue yet, before going home, doing the same on Monday, and finally deciding to wait there properly from Tuesday. Like others in the queue, he was equipped for the long haul, with a camping chair, sleeping bag, clothes, and more. Another queuer said he he had already managed to pre-order four -- one for him, one for his partner, and two to sell to make some cash -- and now intended to buy another two. They were for his family abroad, he said, and buying them this way would help avoid additional taxes. A third man had no interest in buying an iPhone X, but had been asked to queue so his boss could get one. He was going home at 6pm on Thursday night, when another colleague would take his spot for the overnight shift. There are similar queues at Apple Stores all over the world, including San Francisco, USA and Singapore. The queues have been encouraged by Apple, which has told customers to "arrive early" if they want a chance to nab themselves an iPhone X on launch day on November 3. It goes on sale at 8am local time at stores around the world.